Meet Amber and Carlos. Amber here is a fellow photographer in the Raleigh area (you can check out her gorgeous work here) but she's so much more than that!! Besides owning her own photography business, she and her husband Carlos also own the cutest vintage photo booth bus you've ever seen. It's literally a VW bus that's rented for parties, weddings, and all that jazz... it's ridiculous (and you can see that all here) and I love it immensly. Amber also does a whole bunch of other stuff, PLUS she's a Mommy to the cutest 2 girls you've ever seen. She's a super busy lady!!! We all have those people in life... the ones that push us, strive to make us better, and want nothing but positive things to come your way. This girl here.... she's it for me. Amber has believed in me from the moment I met her over a year ago at a styled shoot. She's guided me towards wonderful decisions and pushed me to reach farther and do better. She's believed in me and my business and my abilities waaaaay before I did. And for that. I'm eternally grateful. I am better because of her. 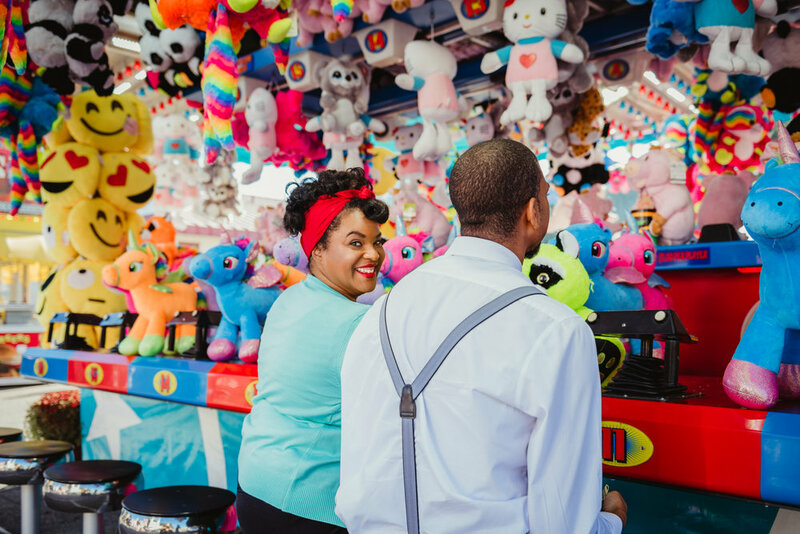 Amber contacted me this past summer saying she wanted to do an anniversary session with her husband at the NC State Fair. Which brought 2 emotions... HOLY CRAP because she chose me to do these for her! And, HOLY CRAP I have to go to the fair!! The NC State Fair is kind of a big deal here. There are THOUSANDS of people that come to this fair over the course of 11 days. Schools have early release days (or days off) just so families can go. The food is insane, the rides are super fun, and there are balloons and music and agriculture and animals EVERYWHERE. So when Amber said she wanted to do them at the fair, I immediately felt panic... me and large groups of people don't normally go well together. But for Amber... anything! I met up with Amber and Carlos at the fair on the last weekday it was open, and it was perfect! The air was crisp, the sky was blue, and even better... we were missing the huge crowds. SCORE! 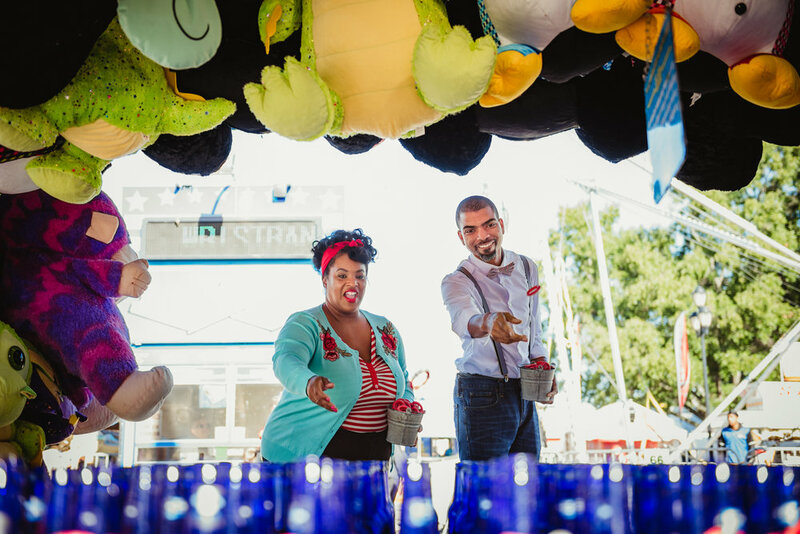 Amber and Carlos are having their 5-year wedding anniversary this upcoming New Years and wanted to celebrate their love with some ring toss, cotton candy, and some good ol' fashioned snuggling. True to their word, we ate our way around the fair, played games, rode the carousel, won some prizes for their girls, and had an absolute blast!! They had people congratulating them all morning but mainly they just created happiness and smiles everywhere they went. I mean really, look at how cute they are... how could they NOT??? Amber and Carlos, it was an absolute pleasure and true honor to be a part of this shoot for you. Thank you for trusting me with your vision, but more importantly, thank you for honoring me with your friendship. You're pretty much stuck with me, so.... hope you don't mind! Happy Anniversary you crazy kids!! !